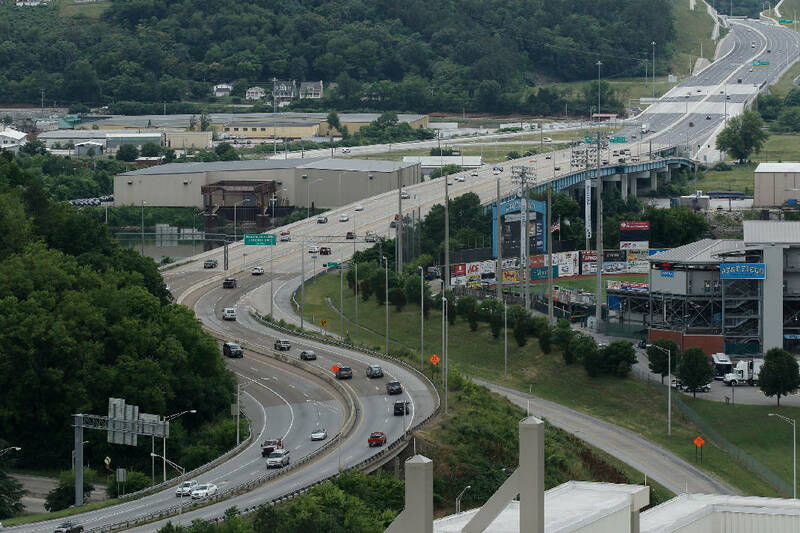 The downtown curves of U.S. Highway 27 are seen from the Republic Centre building Thursday, May 28, 2015, in Chattanooga, Tenn. The Republic Centre is the tallest building in Chattanooga. U.S. Sen. Bob Corker, right, and Tennessee Gov. Bill Haslam, center, shake hands with CPD Chief Fred Fletcher at a memorial for the five military servicemen killed in the July, 16, attacks on two military facilities held Saturday, Aug. 15, 2015, at McKenzie Arena in Chattanooga, Tenn. Vice President Joseph Biden and Secretary of Defense Ash Carter spoke along with representatives from the U.S. Navy and Marine Corps. 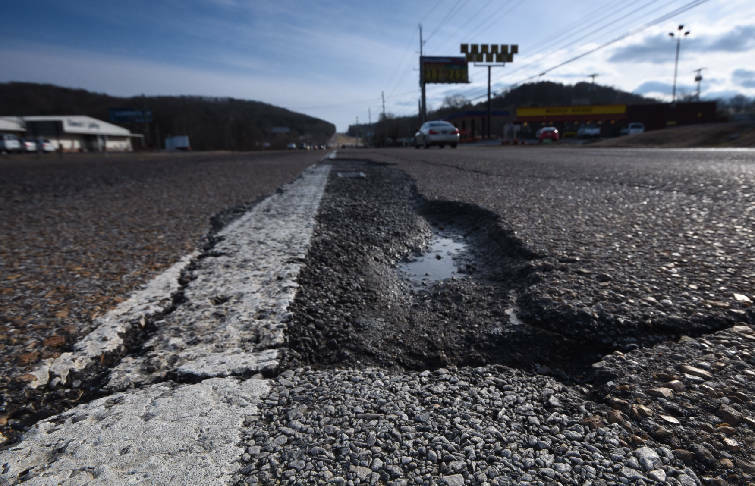 Southbound traffic on Dayton Pike at state Highway 153 must deal with eroding asphalt in the left lane near the U.S. Highway 27 exit, just south of Soddy-Daisy. Tennessee Gov. Bill Haslam visited Chattanooga today as the state faces a multi-billion dollar backlog of highway projects across the state. In a meeting with Chamber of Commerce officials, Haslam and Tennessee Department of Transportation Commissioner John Schroer touted the state's maintenance record and lack of transportation debt, but also warned of funding challenges ahead. "We know that we can't depend on the federal government to be the funding partner that it once was," Haslam said. "We also know that as our infrastructure ages, maintenance becomes more important and more expensive." State revenues alone won't be able to keep up with maintenance costs, much less new projects, according to a 2015 Tennessee Comptroller's report. The state had to launch a statewide pothole repair program in March after a series of brutal winter storms followed by heavy rainfall. Moreover, more fuel-efficient cars have reduced gas tax revenues, which are needed to maintain roads, and Congress has failed to pass a long-term transportation funding bill in a decade, according to a news release from the Governor's office. Meanwhile, Tennessee's population is expected to grow by 2 million within the next several decades, according to the news release. Schroer said as part of planning for the future, the state needs communities like Chattanooga to "help prioritize projects to make sure we're addressing evolving traffic patterns, population growth, safety issues and the many other things that impact our infrastructure, and these conversations are invaluable to the process." The state was poised to start work widening the U.S. 27 corridor that passes through the heart of Chattanooga, with a scheduled completion date of Spring 2014, but the $80 million in funding for the project was yanked after local urban planners raised objections. The state is also considering adding an exit off of I-24 to access the U.S. Pipe property, plans for which have called for Interstate access, but that, too remains in the planning stages. Tennessee Senate Transportation Committee Chairman Jim Tracy is scheduled to talk about infrastructure and the gas tax in an Oct. 28, 2 p.m. hearing at the Hamilton County Courthouse.